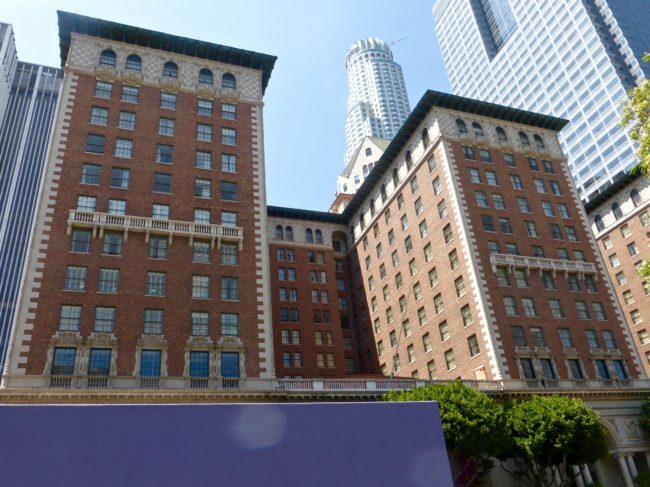 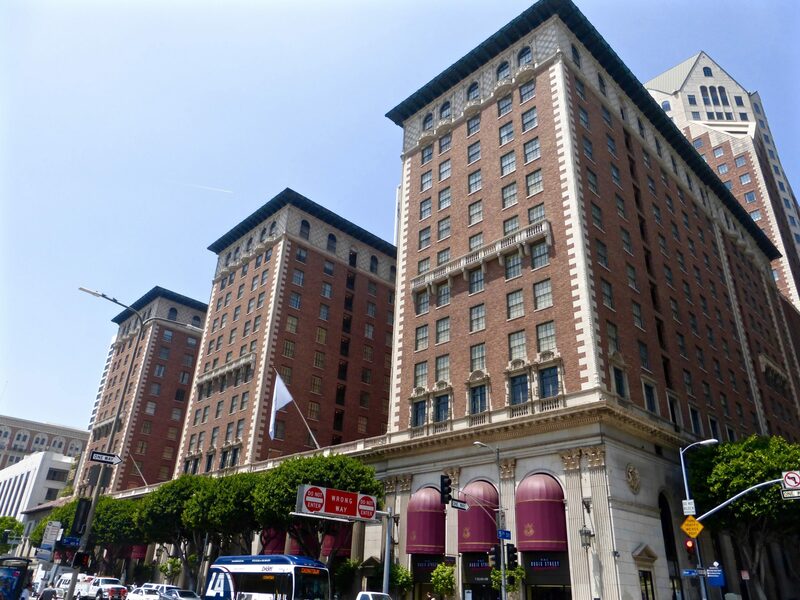 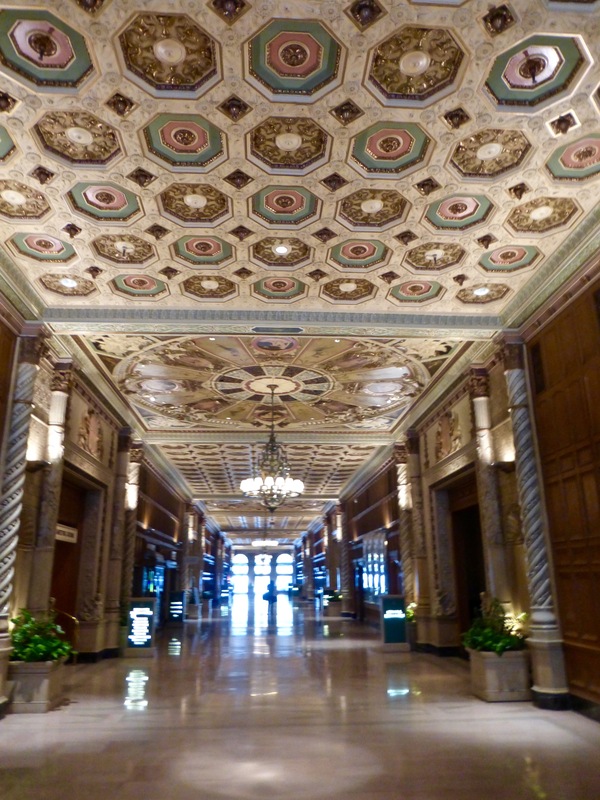 Having made reservations a few weeks in advance with the Los Angeles Conservancy, Tracy and I headed to downtown Los Angeles on what turned out to be a very hot Sunday afternoon to check out their tour of one of the city’s most famous and venerable hotels. 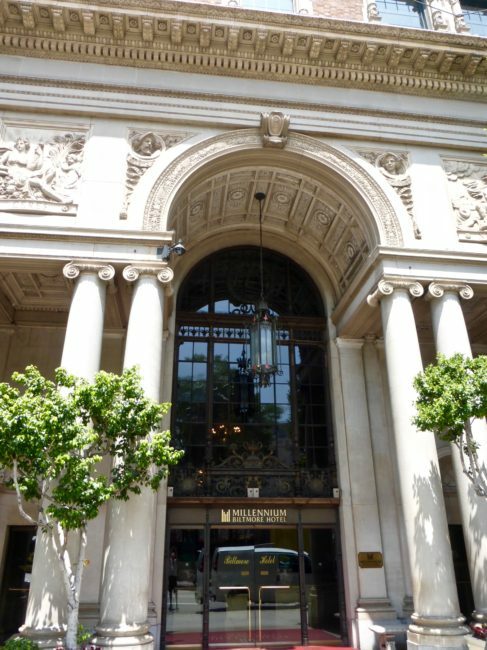 Parking nearby, we descended a million stairs (slight exaggeration). 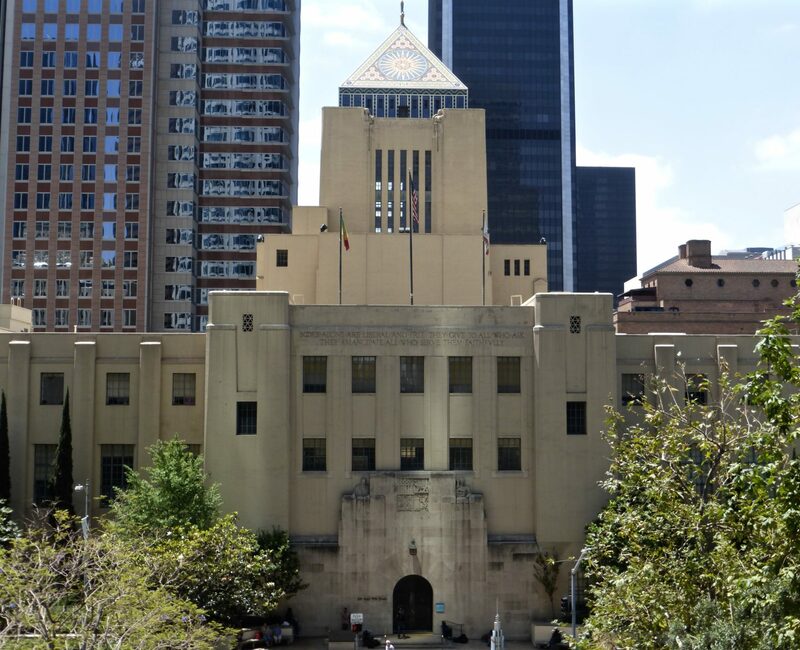 and with the Los Angeles Library (a tour I will be doing soon) looming in front of us, we were on our way to the Millennium Biltmore Hotel. 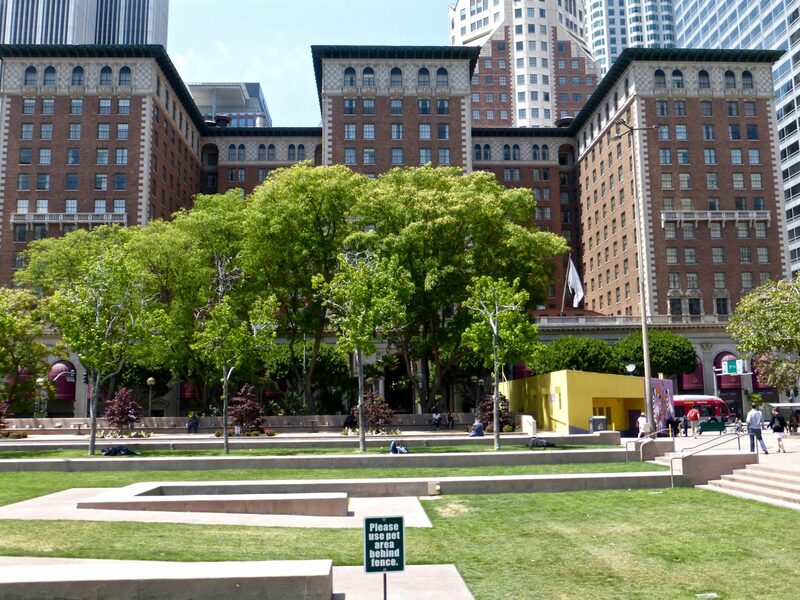 The tour started at Pershing Square (across the street from the Biltmore), so we decided to hang out there for a little while after lunch. 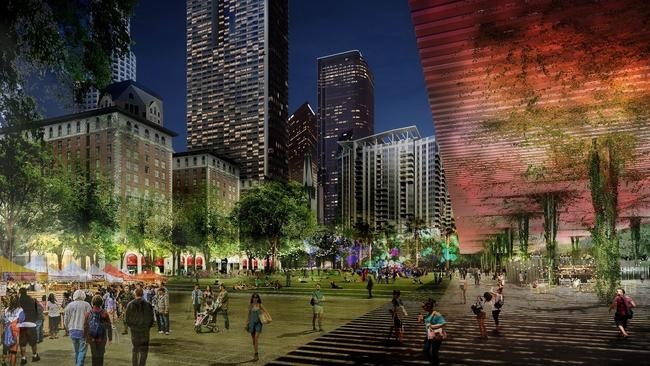 Fortunately, Pershing Square is set for a renovation, which is a good thing because it is one unattractive public space…a monstrosity of cement. The new design team might want to start with some shade trees. 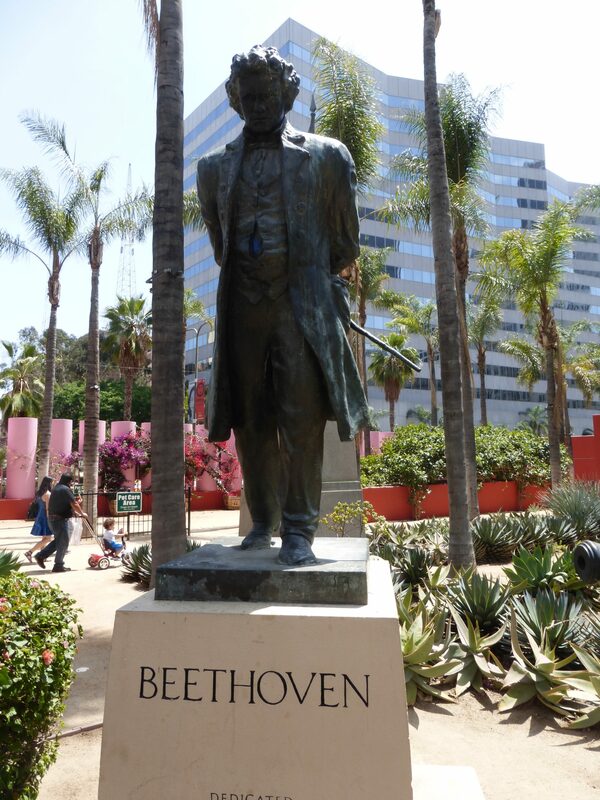 I checked out a couple of statues..
…and Beethoven, who must have been telling Tchaikovsky the news about the new design. 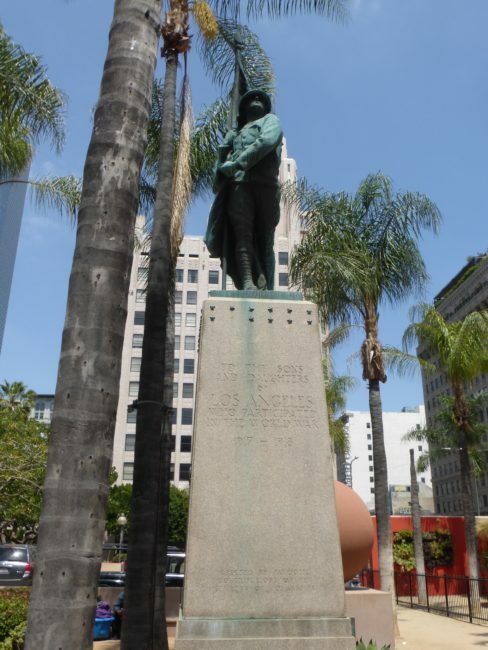 Historical tidbit: Pershing Square is named after General John J. 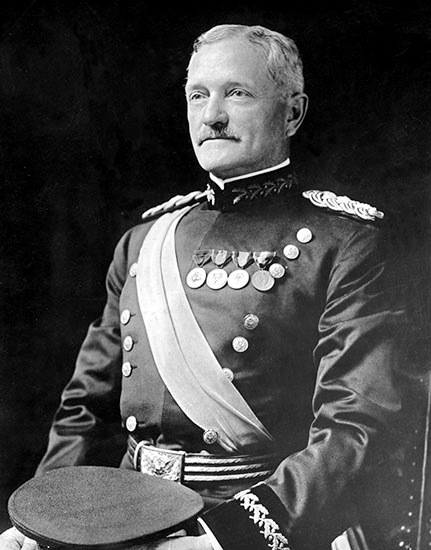 “Black Jack” Pershing, a World War I hero. 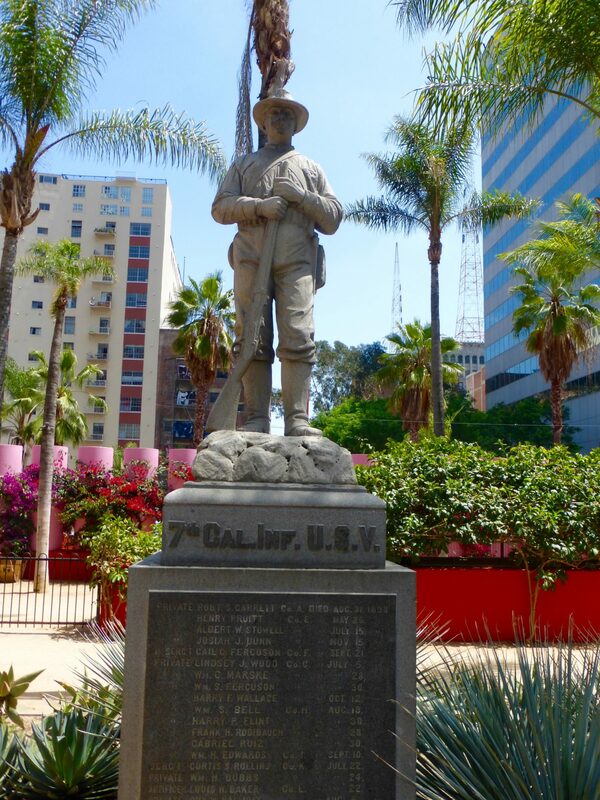 He was the United States Army general who led the American Expeditionary Forces to victory over Germany in World War I, and is the only American to be promoted in his own lifetime to General of The Armies, the highest possible rank in the army. The tour started promptly at 2 p.m., which was good since heat stroke was beginning to set in. 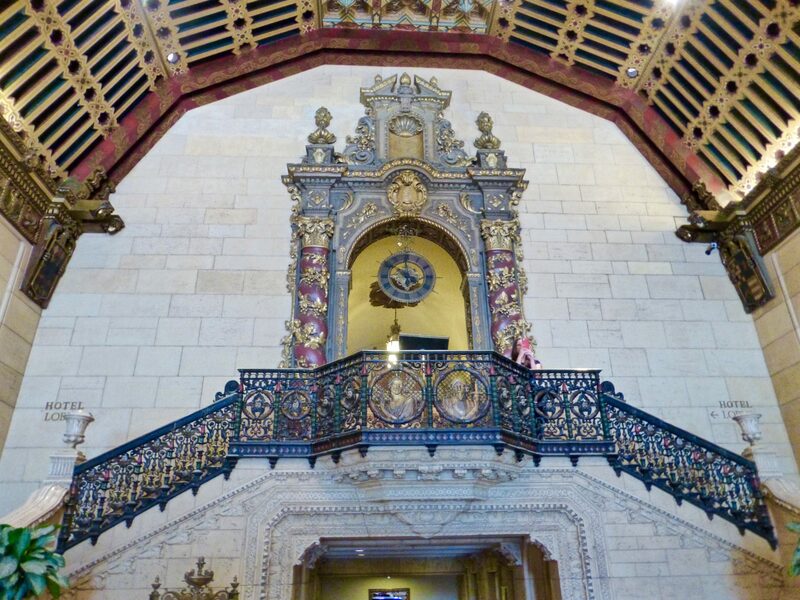 Our very knowledgeable (and humorous) guide, Nicole, loves the Biltmore, so the usual 1 ½ hour tour turned into a three-hour tour (very Gilligan-esque) and history lesson on the Biltmore…and much, much more. 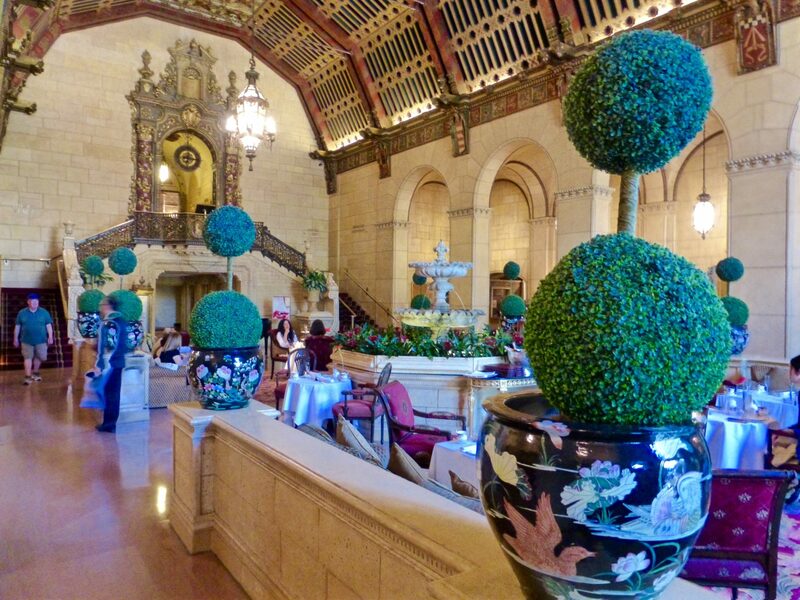 Construction on the Biltmore began in 1923 and was completed in just 18 months for $10 million. 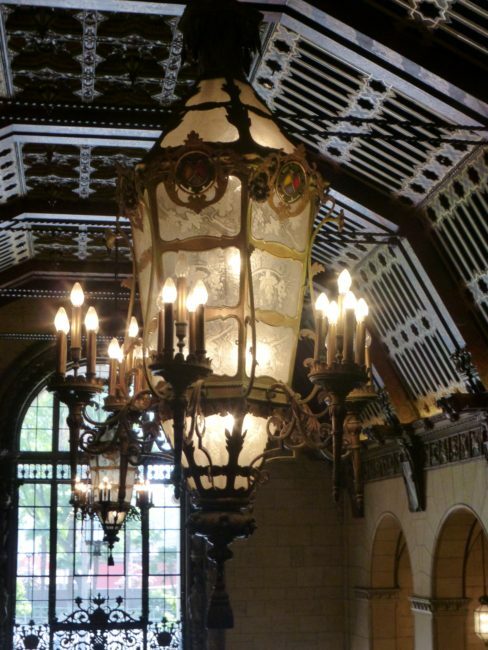 The original construction had 1,000 rooms. In 1925, a theater was added to the building (the Biltmore Theatre held 1,700 people and closed in 1964). 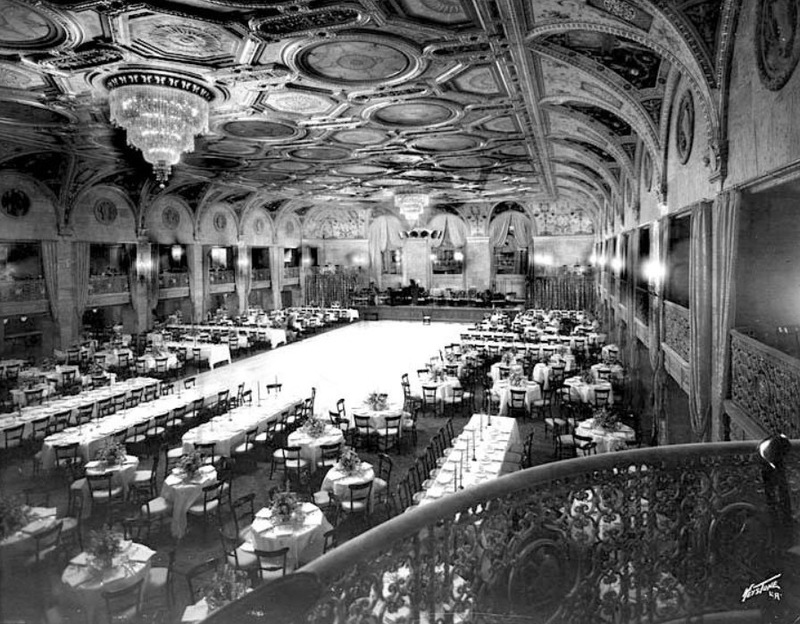 In 1927, an additional 500 rooms, ballroom and a health club were added. The original architects, New Yorkers’ Schultze and Weaver, never attended architectural school. Obviously that fact did not hurt their career. 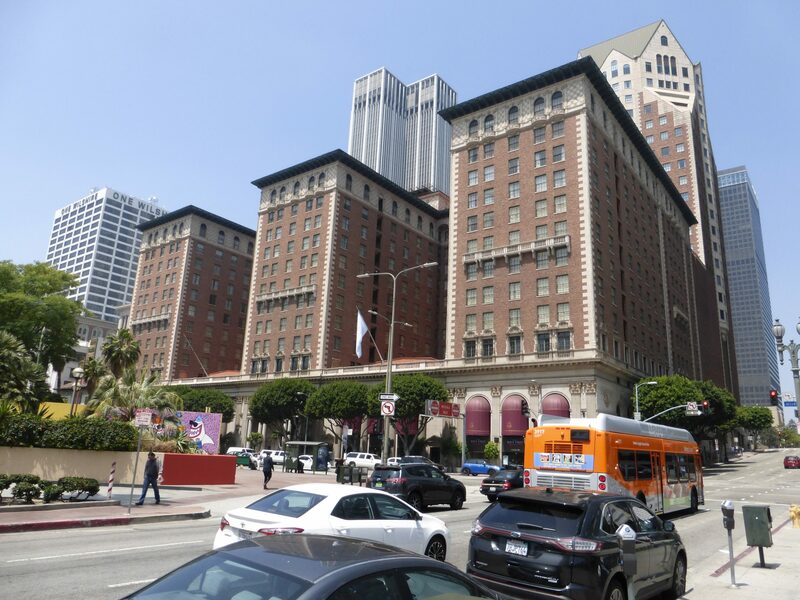 They are also responsible for New York’s Waldorf Astoria Hotel, Park Kane Hotel, the subway terminal building in NYC and many other buildings both there and here in Los Angeles. The Biltmore was built in the Beaux Arts style. 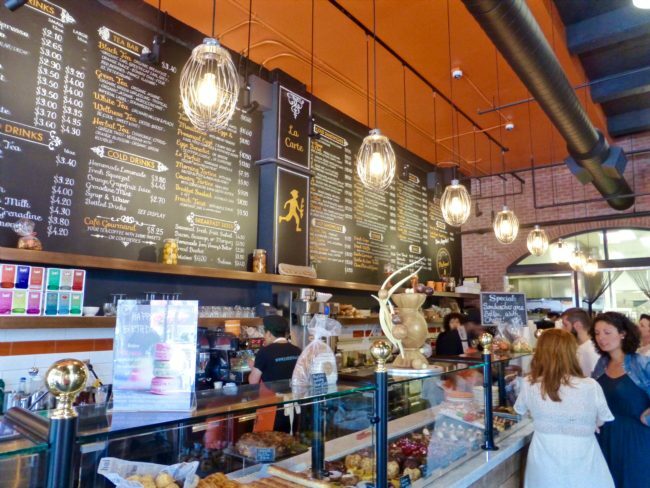 The exterior is composed of seven different types of colored bricks. One reason the hotel was able to be finished in 18 months is that the interior detail is mostly plaster made to imitate wood or stone. 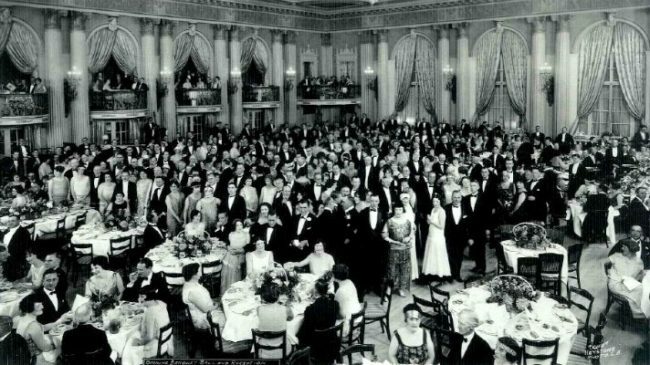 Three thousand people attended the gala opening in 1923, including numerous Hollywood stars (Mary Pickford, Myrna Loy and Cecil B DeMille to name a few) and dignitaries. 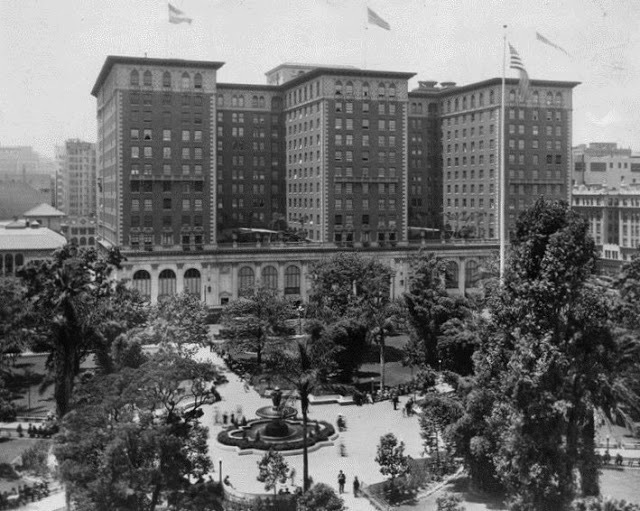 Providentially, in 1969, the Biltmore Hotel was designated a Los Angeles Historic-Cultural Monument by the city of Los Angeles, because by the 1970s the hotel, like much of downtown LA, had fallen into disrepair (I can attest to that because I worked downtown for many of those years during the summer). It was sold for $7.5 million to a developer from Canada who put $50 million in renovations (an amazing job they did) into the hotel and fortunately retaining all the historic details of the hotel. 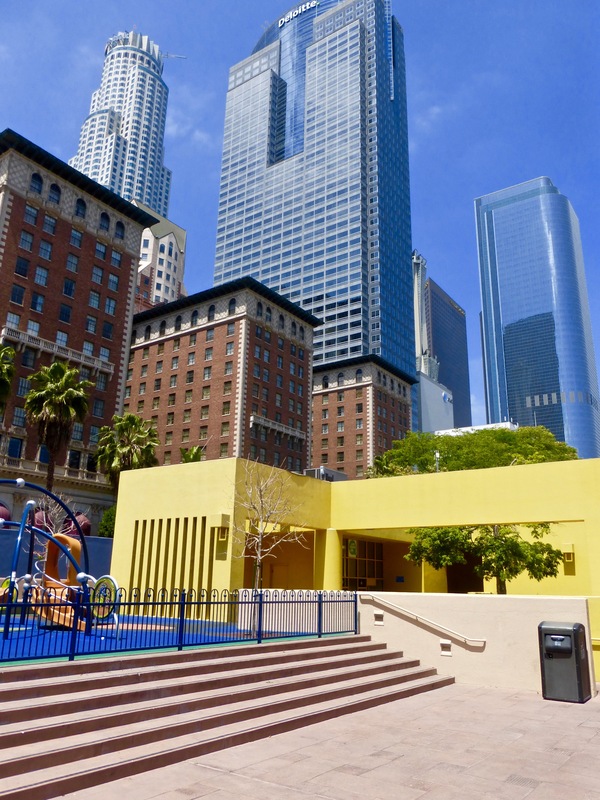 In the mid-1980s the tower was constructed, adding office space and parking. 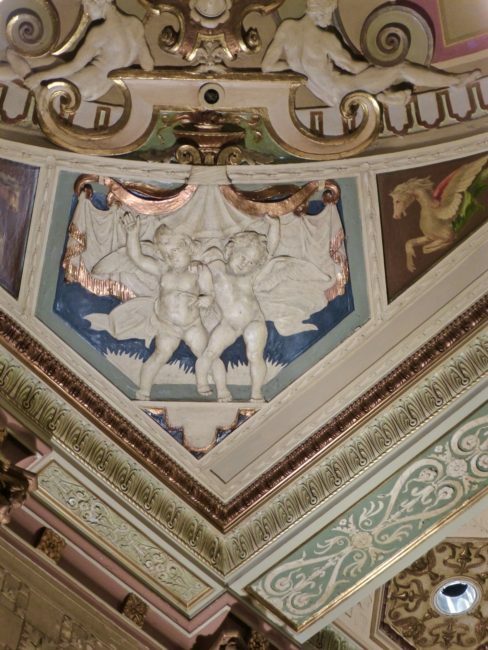 Nicole talked about the “Biltmore Angels,” a heavily incorporated design element here. Angels are a symbol of the city (unlike the Los Angeles Angels of Anaheim) and the Biltmore, too. 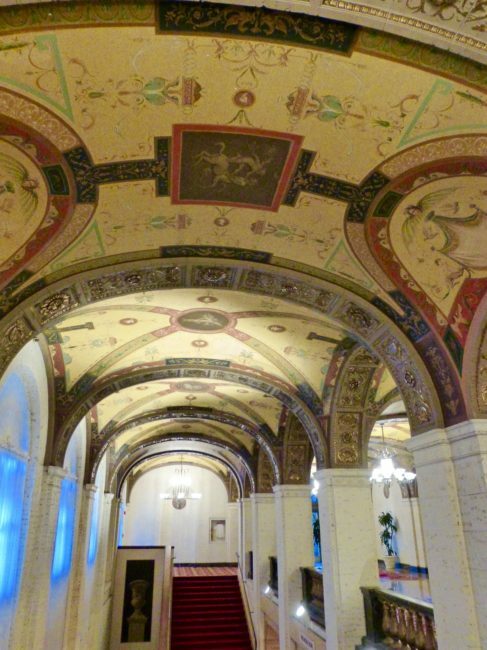 Frescoes and murals, including at least 500 of the “Biltmore angels,” are located throughout the hotel’s interior and exterior. 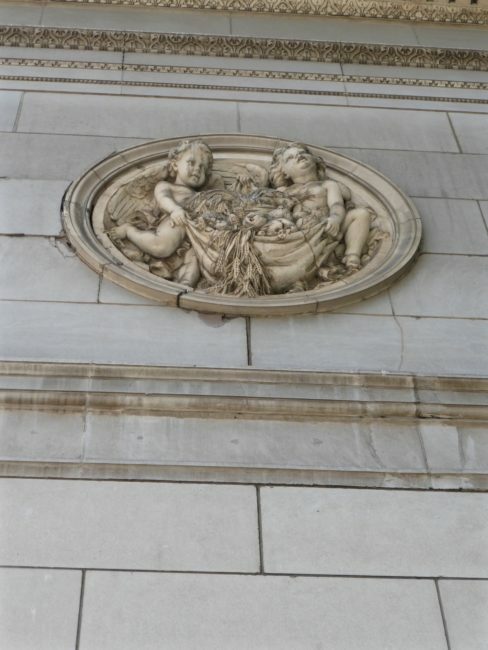 There are huge, stone columns on the building’s exterior. 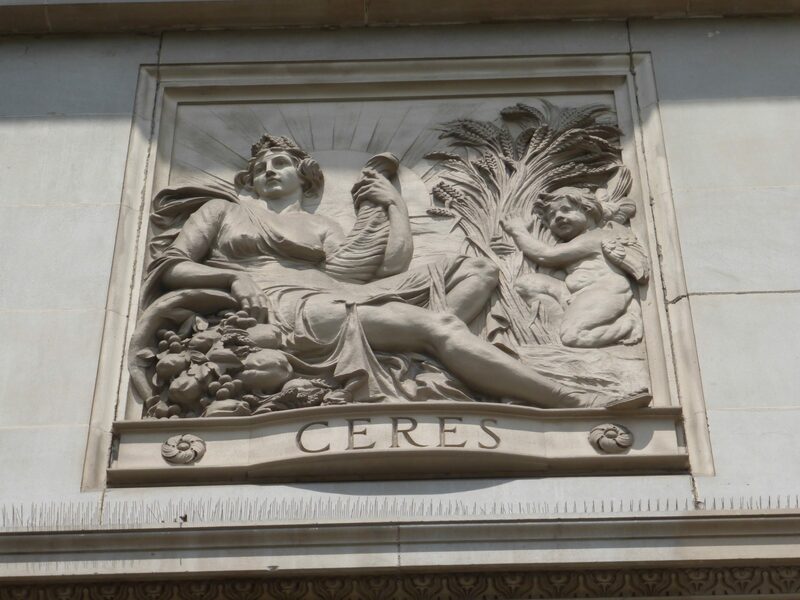 Before entering, we looked up to see Ceres, the Roman Goddess of Agriculture, on the façade of the hotel. 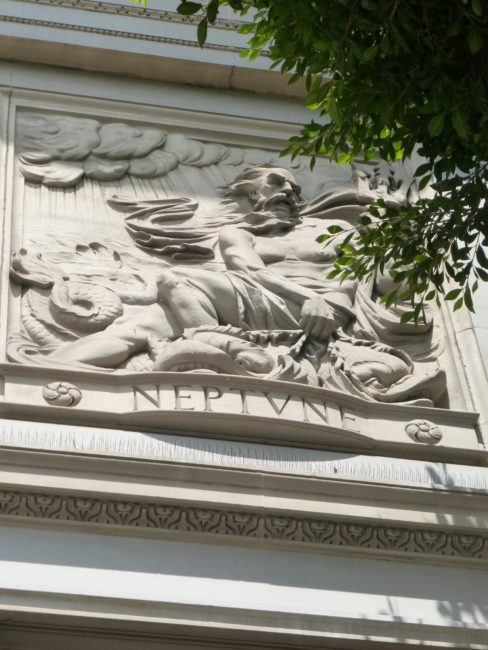 Not to be outdone, the King Of The Sea, Neptune, was up there, too. Stepping inside, we rendezvoused at the appropriately named Rendezvous Court, which was once the hotel lobby and is now a spot where visitors can get a spot of tea in the afternoon. Even on this hot day, many people had gathered for a tea rendezvous, which might explain the bags under their eyes. 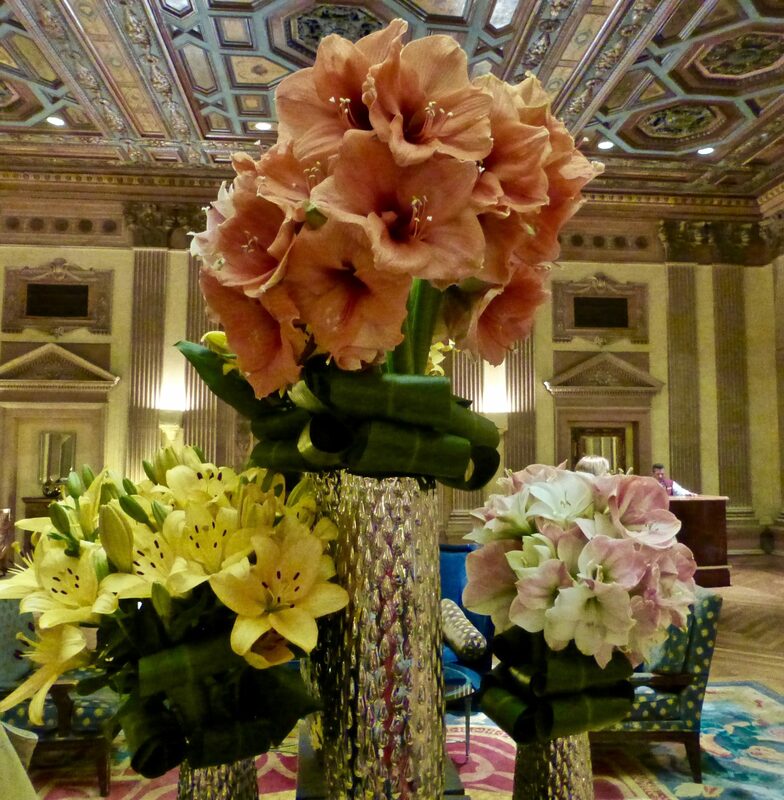 This magnificent former lobby of the hotel was designed by architect Anthony Heinsbergen. 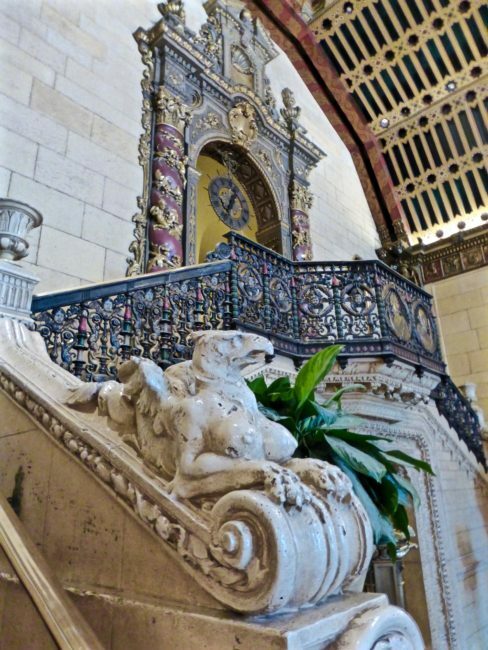 The Rendezvous Court includes a Moorish beamed ceiling constructed of carved plaster (meant to look like carved and painted wood), and a beautiful Spanish baroque staircase leading to a 350-foot long Galleria. …and there is a beautiful fountain in the center of the court. 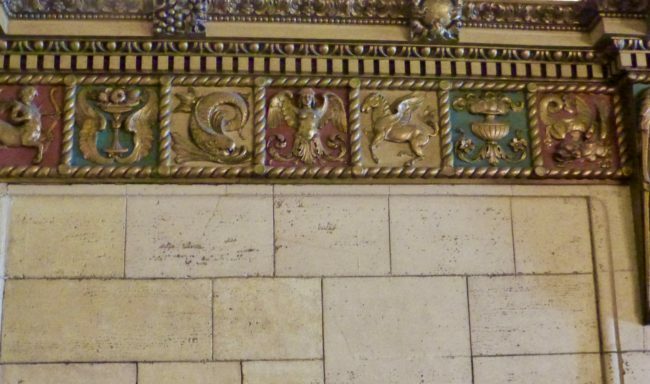 The detailing around the top of the walls contains various figures. On this floor we also checked out the “Men’s Grill,” which looked vaguely familiar. 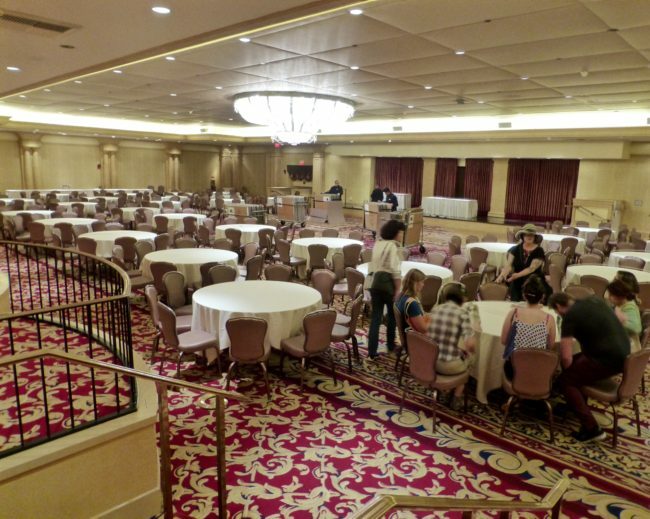 In a Déjà vu moment, I realized this was also the room that used to house my mom’s favorite French restaurant, Bernard’s. 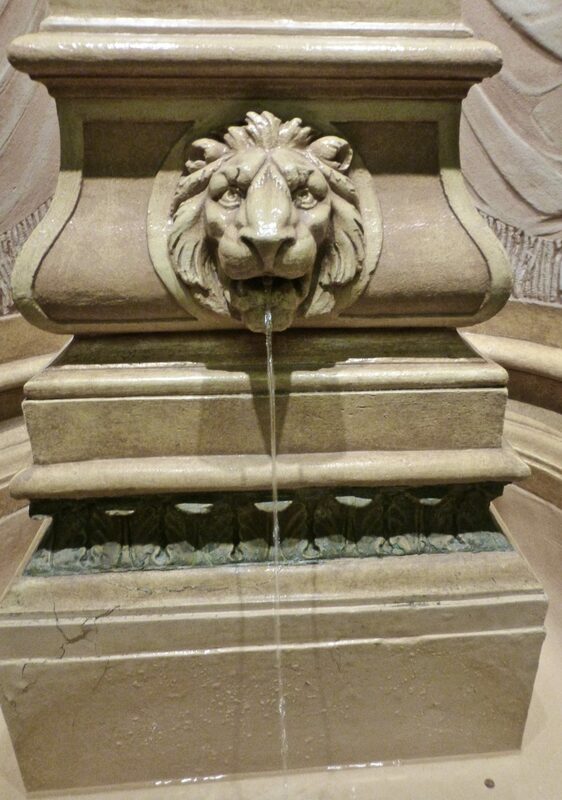 Originally, this was an area for only the “gents” to hang out. 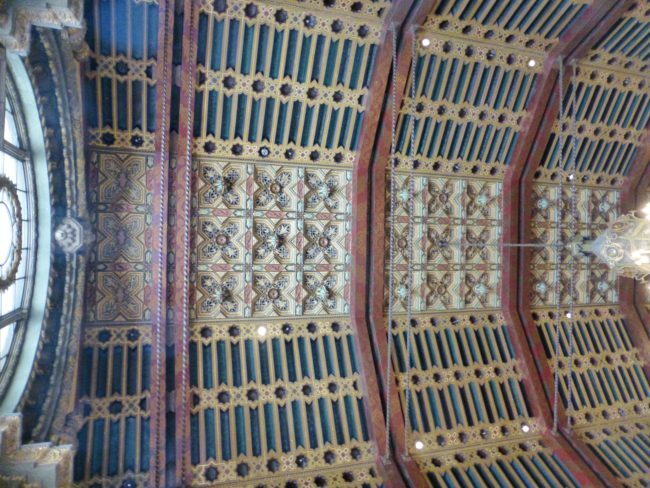 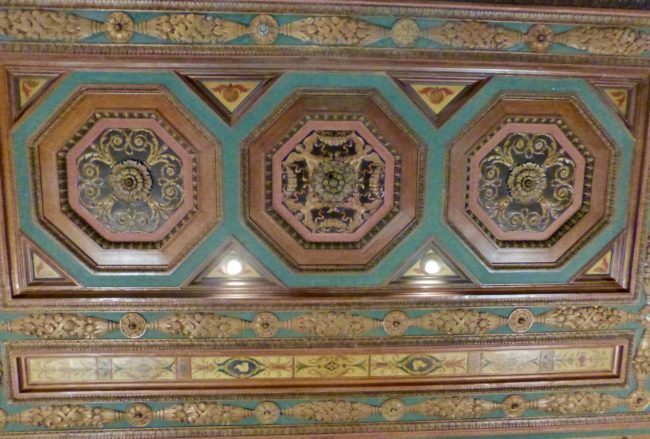 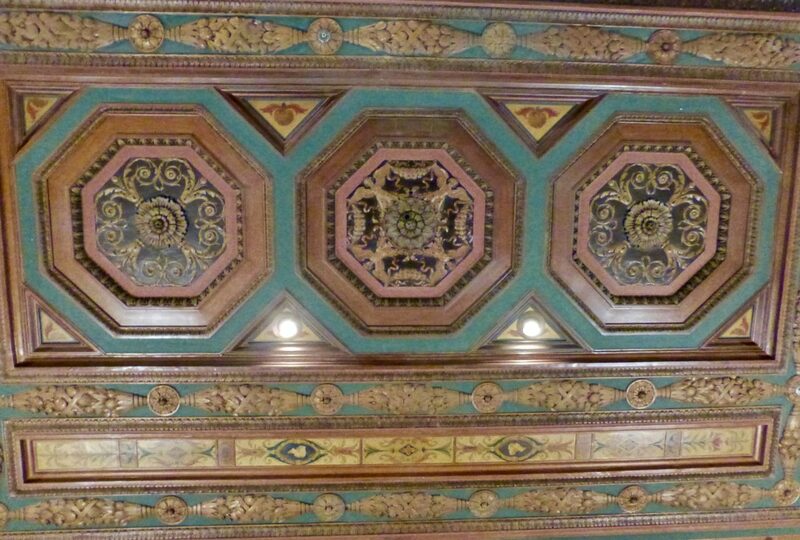 Now it’s used as a banquet room, which also has some cool detailing. 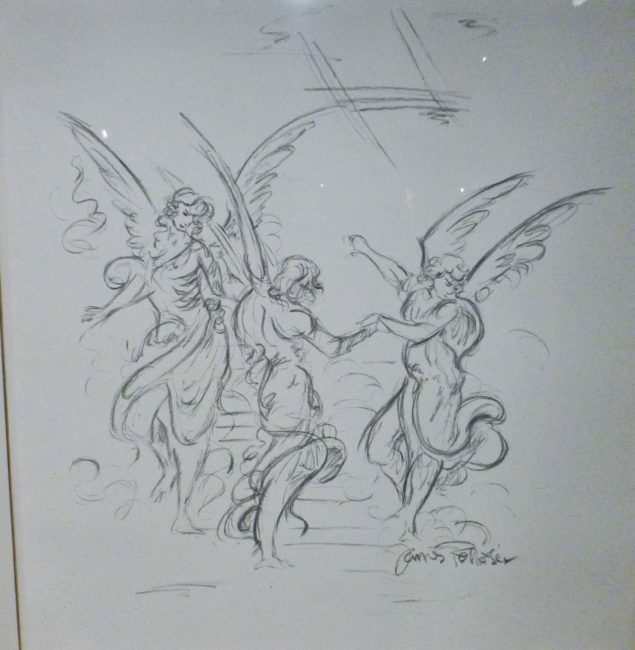 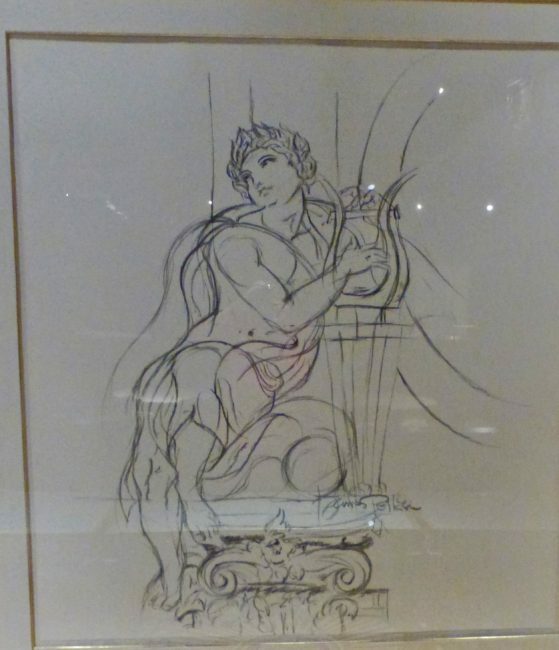 The Biltmore Angels could be seen here, too, this time in an etching, and also a lute playing figure. It was time to walk up that gorgeous staircase. 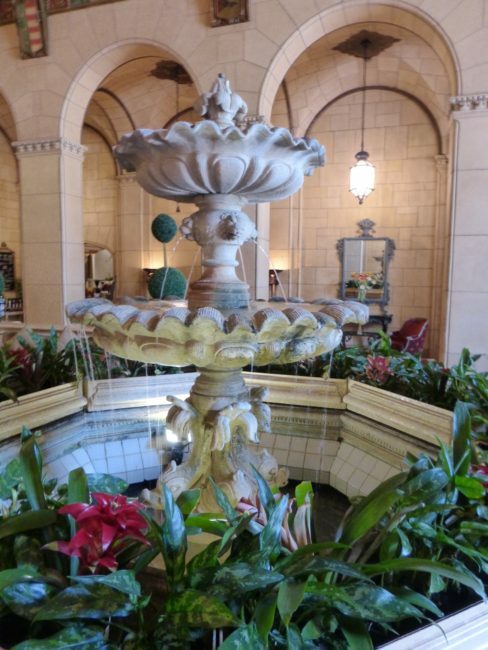 Once at the top of the stairs, we stepped inside the Galleria, a promenade that connects to many of the grand rooms of the hotel and runs the full width of the property. Giovanni Smeraldi, an artesian from Palermo, Italy, who also worked on the Vatican, the Blue Room at the White House and numerous historic public buildings in the United States, is the main man responsible for the fresco mural ceilings in the Galleria and Crystal Room. 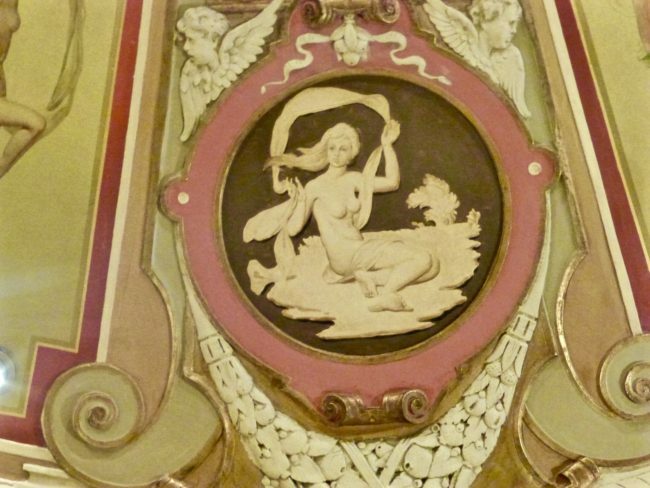 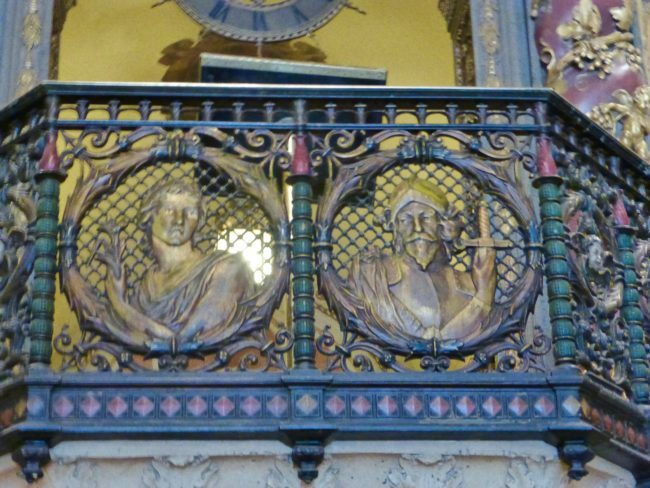 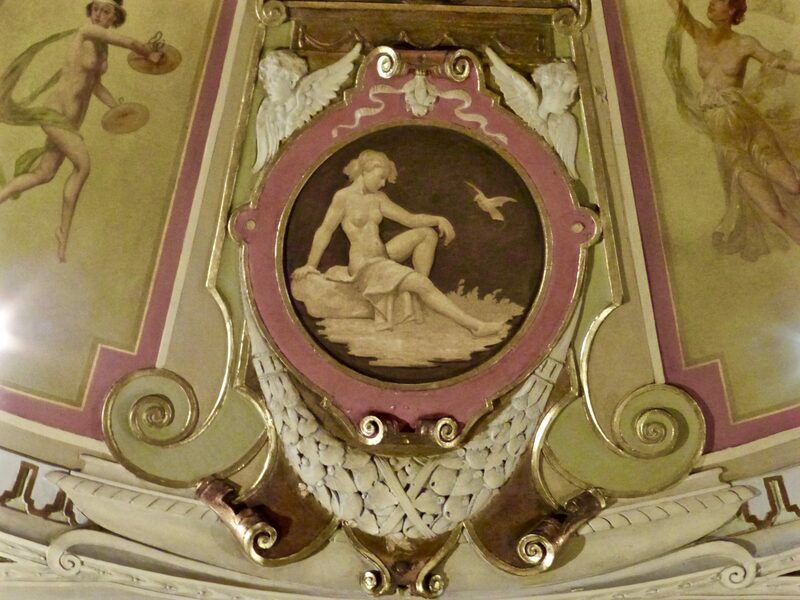 Smeraldi’s plasterwork, sculptures and artwork are found throughout the hotel. 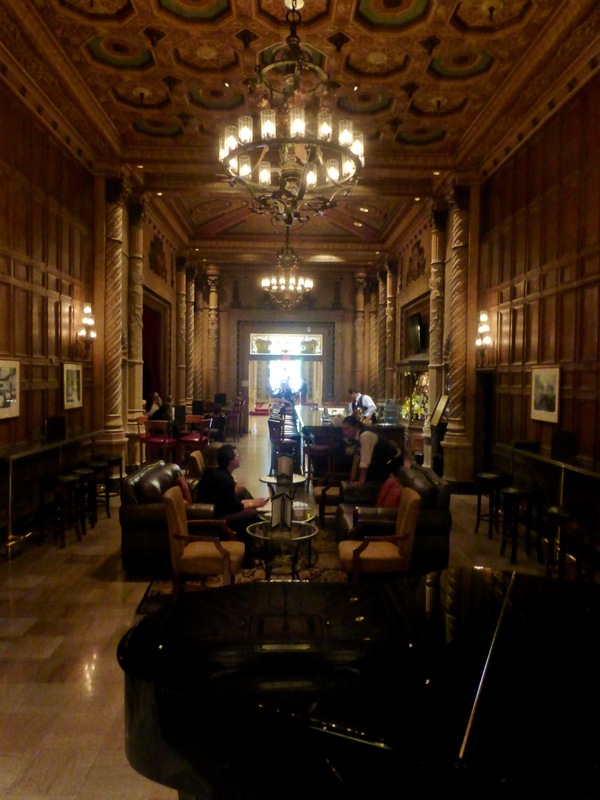 We viewed the Gold Room, which at one time was a speakeasy. 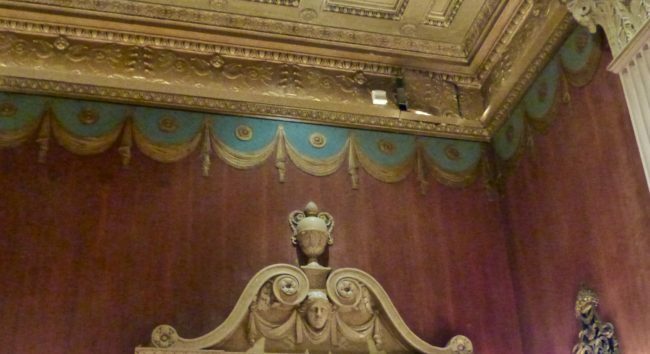 Lots of celebrities hobnobbed here, and in one corner there is an outline of a gold box. 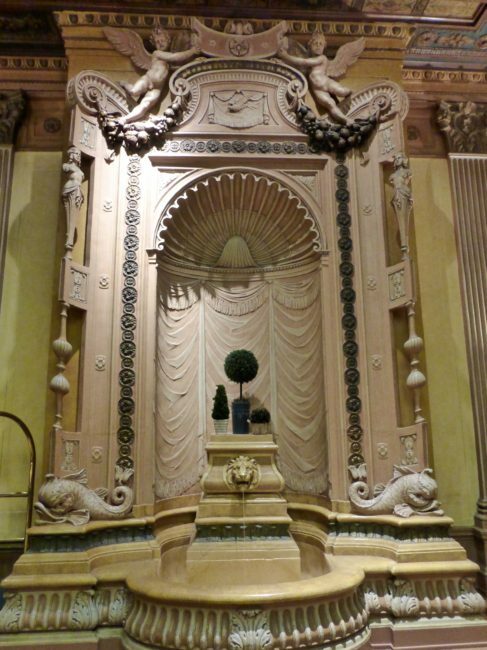 It contained a small (and I mean small) window where the press photographers (aka paparazzi) could take photos of them (early 20th century of TMZ). 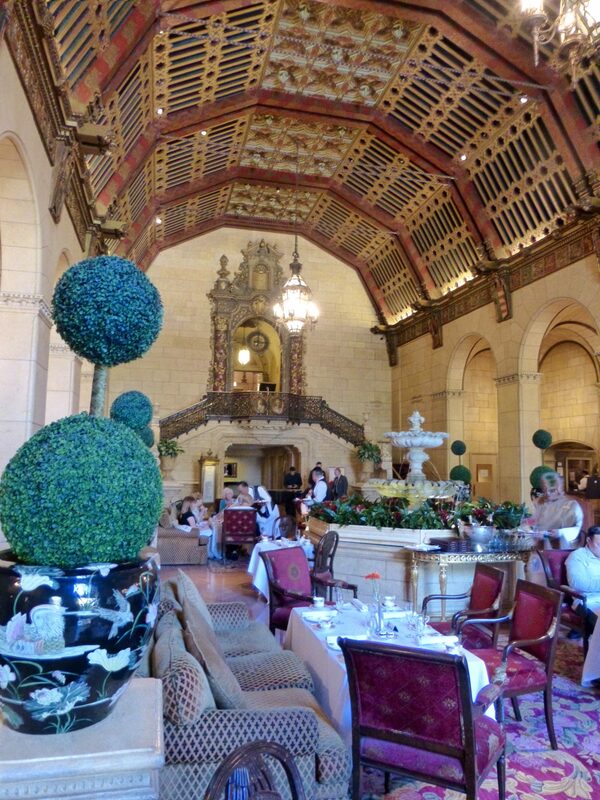 It was originally called The Palm Room, but was redecorated (with the floor raised) and rededicated as the Gold Room. 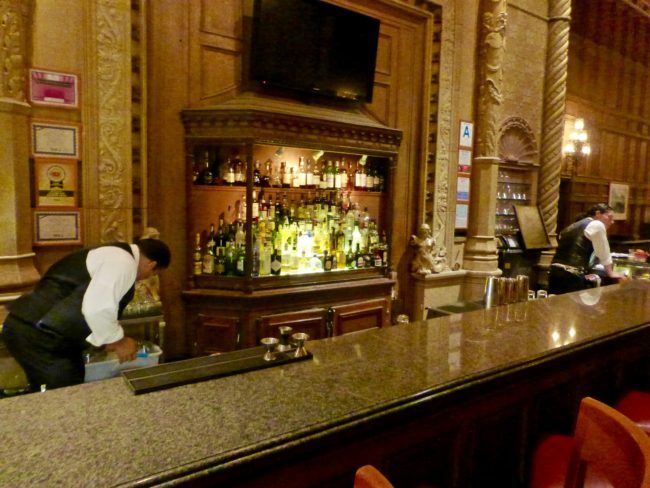 It was also known at one time as “Cocktail Corner.” I’ll drink to that! Then we walked into a room that could have doubled as a hunting lodge. The Emerald Room contained paintings of animals by Smeraldi and lots of different hunting dog breed paintings between the columns. 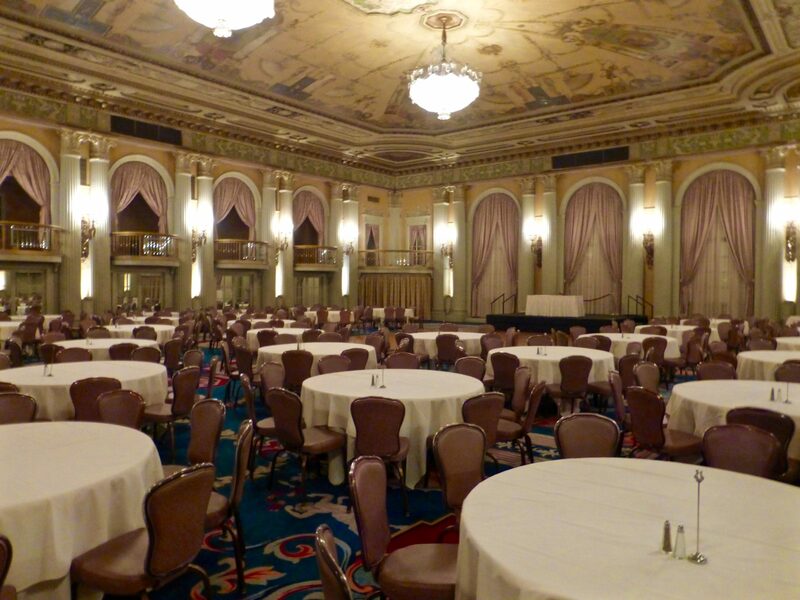 During the 1960 Democratic National Convention, this is the room where Lyndon Johnson realized he was not going to be the candidate for president. Although Smeraldi had worked at the Vatican and the White House, his most beloved project was the Biltmore, so much so that he wanted his ashes to be interred in that fountain. 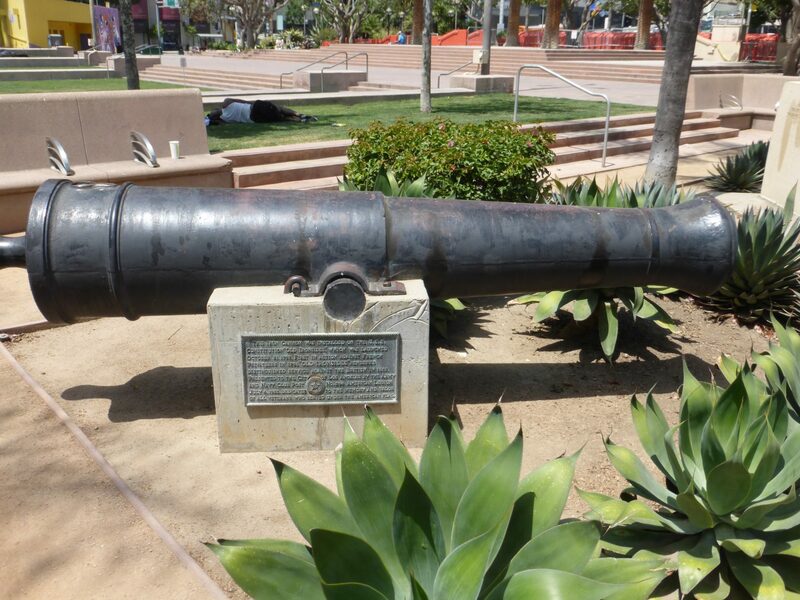 He did not get his wish granted, however. 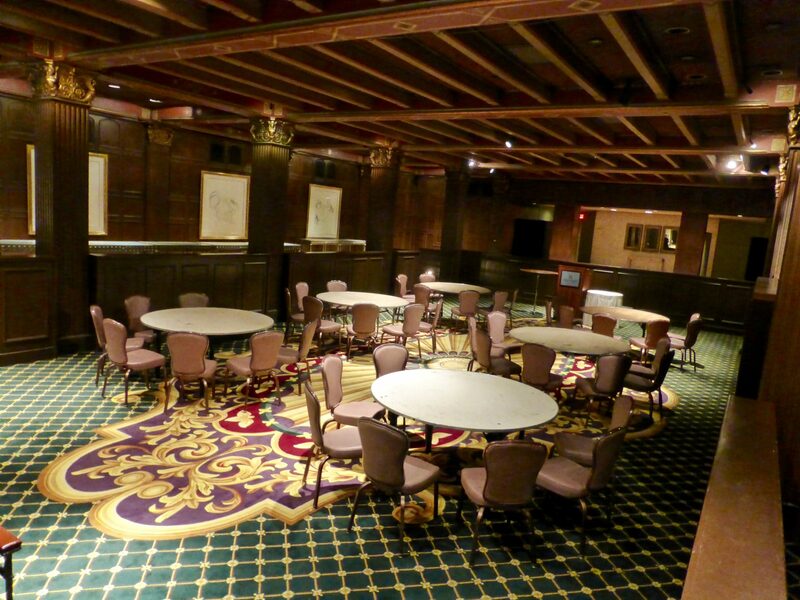 It was once known as the “Music Room,” because it would hold afternoon concerts and tea dances. 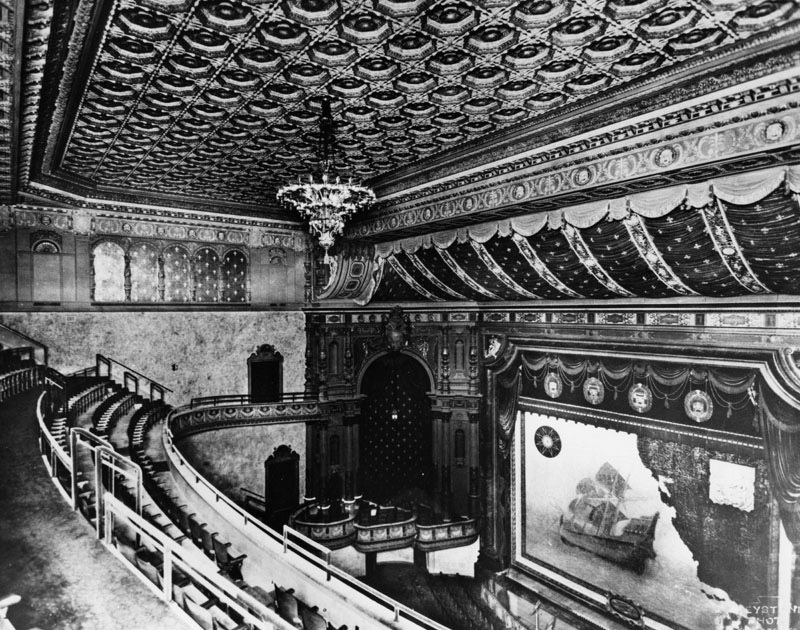 Numerous movies were filmed here. 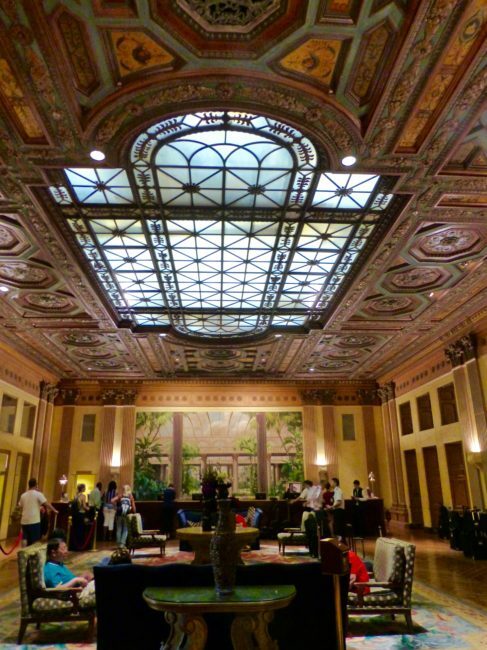 Ghostbusters was partially filmed in the reception area of the Biltmore. Speaking of ghosts, the entire second floor of the hotel is closed off and never used due the presence of spirits (the ghost kind…the other types of spirits can be found in the hotel’s two bars). 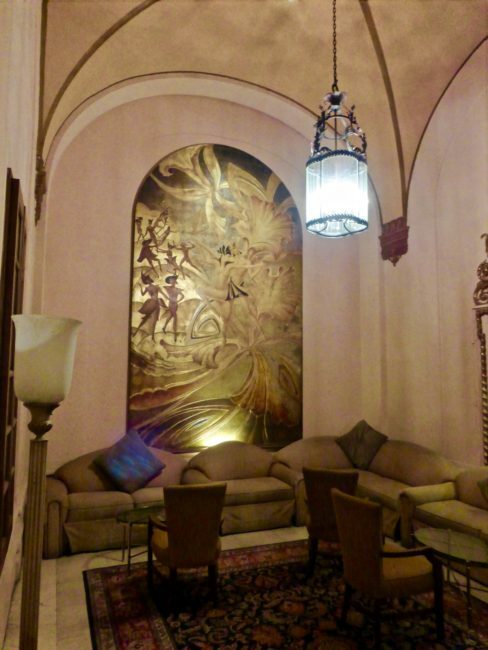 We entered the bar through the Cognac Lounge, which added two paintings that used to reside in the Gold Room. 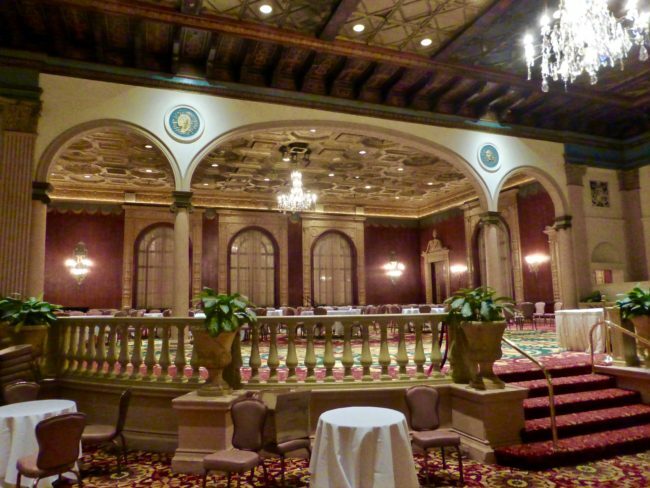 … into my favorite grand room; the Crystal Room, which is Neoclassical in style. 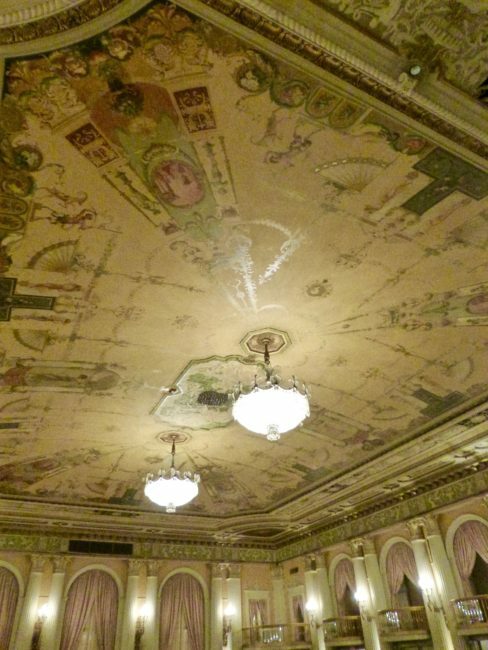 With a few minor exceptions, the Crystal Room is exactly as it was that opening day with the painted fabric ceiling and 12-foot crystal chandeliers. 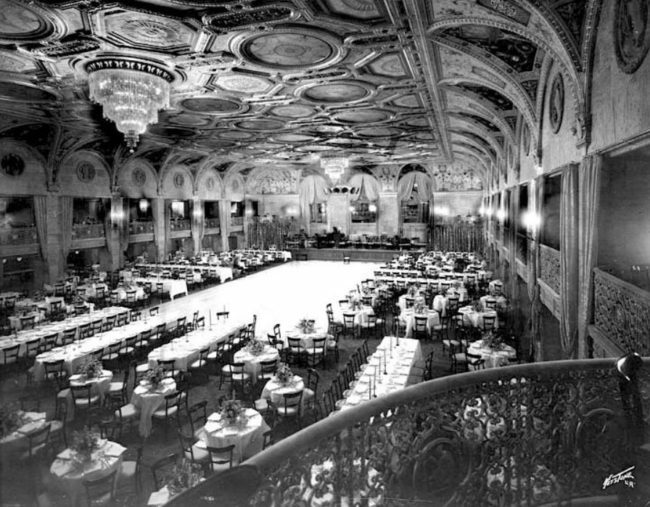 Like the hotel, at the time, the Crystal Room was the largest ballroom west of the Mississippi. 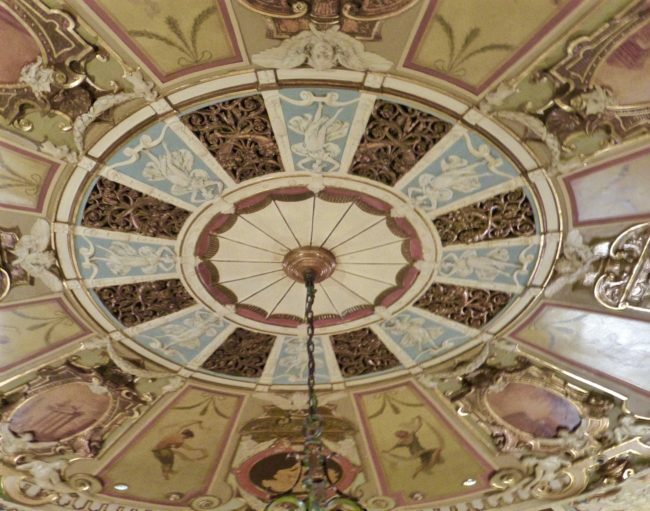 The Austrian crystal chandeliers are something to behold as is Smeraldi’s painted ceiling. 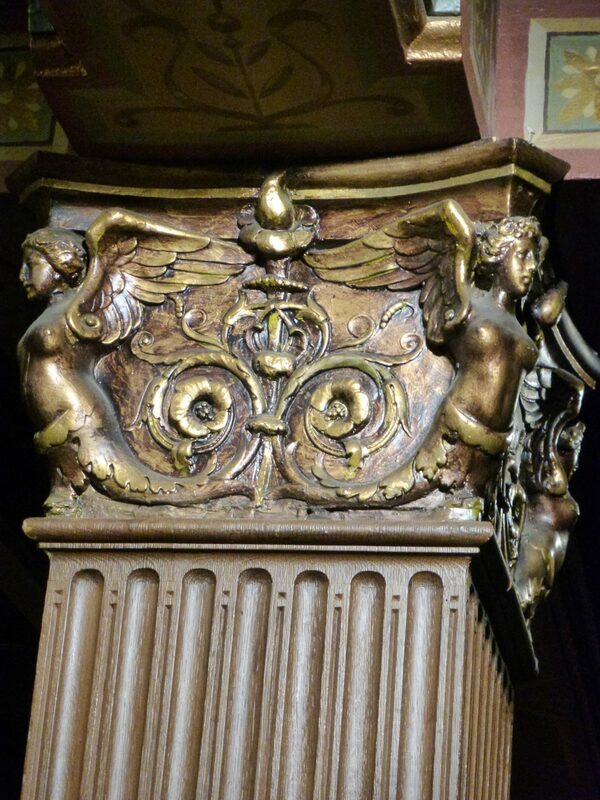 The concept for the Academy Awards and the design for the original Oscar statue were both created in this room. 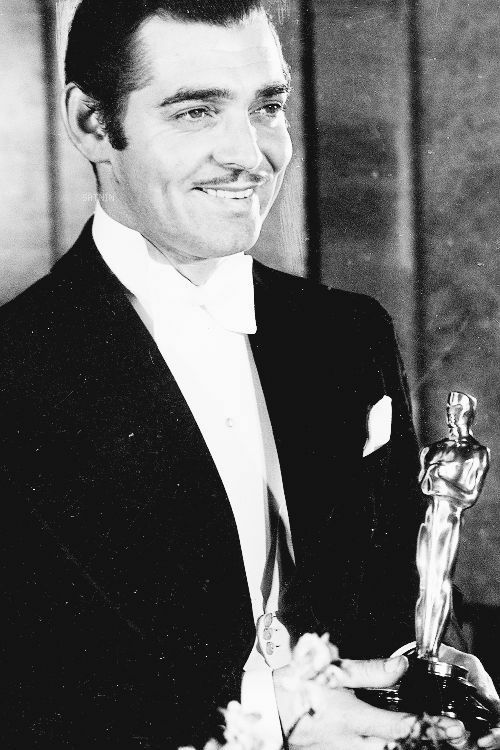 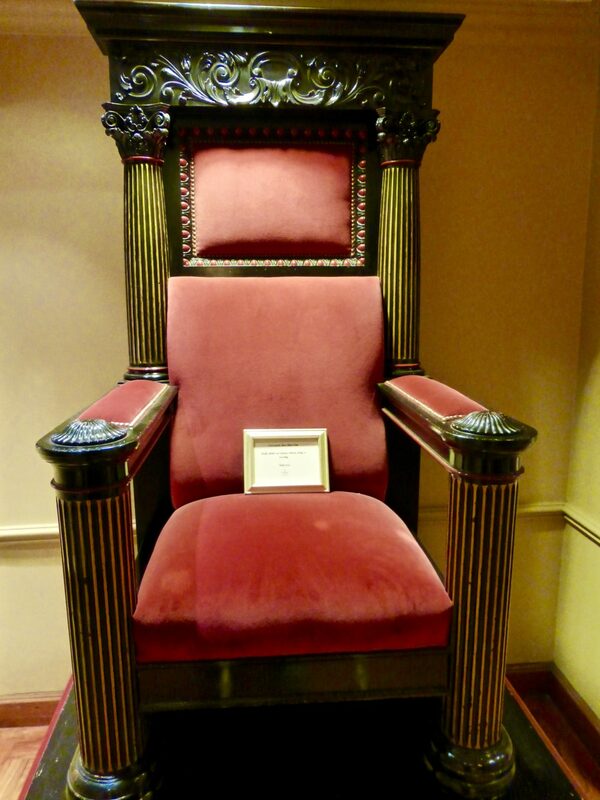 Legend has it that the Oscar statute was drawn on one of the Biltmore’s linen napkins. 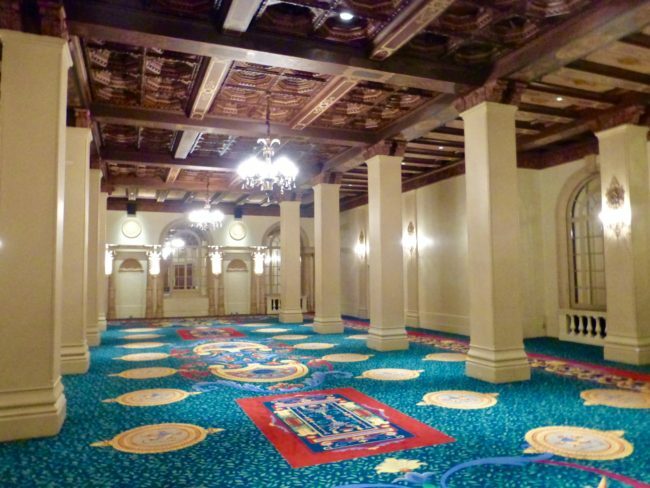 …but was cut in half to make room for air conditioning and other items in the top half of the room. 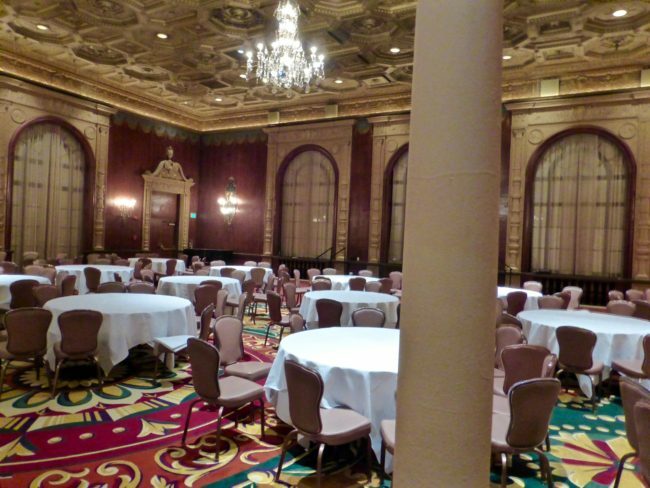 Now it sadly resembles a typical, nondescript banquet room with low ceilings. Eight Oscar ceremonies were held in the Biltmore Bowl during the Academy’s early years of 1931, 1935–39, and 1941-42. In 1977 Bob Hope hosted the Academy’s 50th Anniversary banquet in the same room. 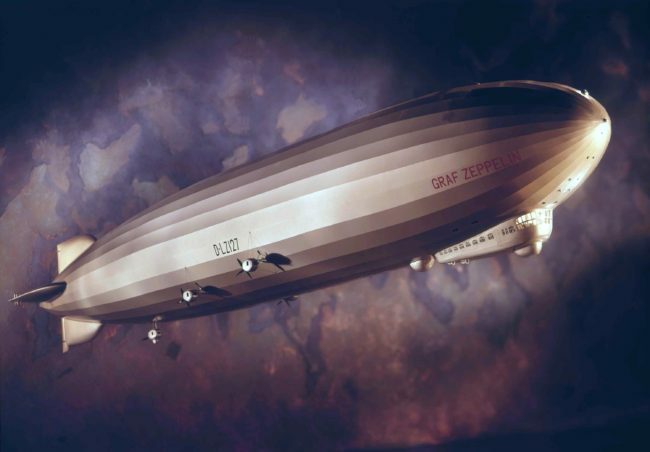 In 1929, the Graf Zeppelin, on an around the world trip, ran out of food and had to make a quick stop at the Biltmore to replenish its pantry (parking must have been brutal). 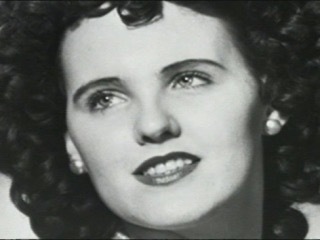 The Black Dahlia was last seen exiting the Biltmore on her way to a bar around the corner. 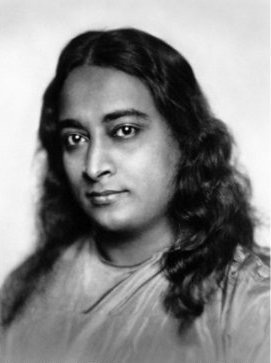 And on March 7, 1952, the well-known Yogi (perhaps even better known than that other Yogi…Berra) Paramahansa Yogananda dropped dead of a heart attack here as he was giving a speech, and the Biltmore is now revered by many as the place of the yogi’s mahasamadhi (act of consciously and intentionally leaving one’s body). …and I hoped I didn’t join the yogi as we climbed the steps back to our car. 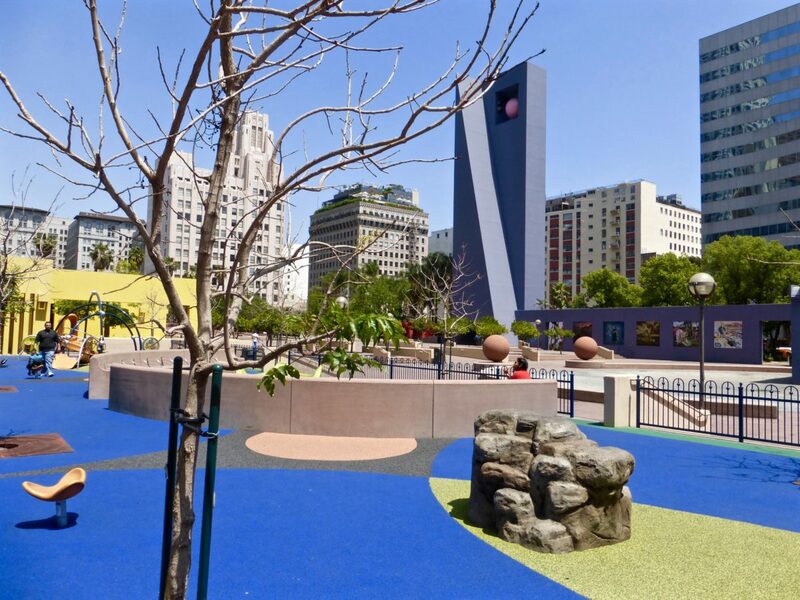 …and if you live in the area, you might just want to join. 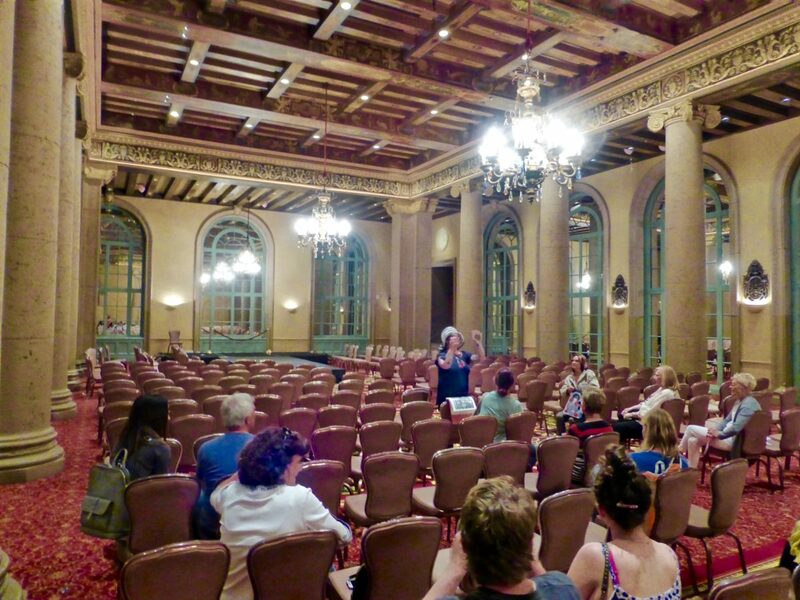 Not only do they do good and important work, but their tours are terrific!